The entire staff is happy to welcome you in a magnificent mansion, situated in the heart of the city center, the capitale of Champagne and only at a few steps from the Avenue de Champagne. This situation places the hotel Jean Moët in the center of the main tourist attractions of the city and in the heart of the “sparnacienne” animation. It is built in building of the 18th Century. With its protected facade and its magnificent glass room of style 1800, called the winter garden, we welcome you in our tea room after your visits of the capitale of Champagne. Make yourself at home in one of the 67 guestrooms, featuring kitchenettes with refrigerators and microwaves. Complimentary wireless Internet access keeps you connected, and flat-screen televisions are provided for your entertainment. Conveniences include phones, as well as desks and coffee/tea makers. A stay at Hôtel Le Magellan places you in the heart of Epernay, within a 10-minute walk of Moet et Chandon and Leclerc-Briant. This hotel is 0.5 mi (0.8 km) from Janisson-Baradon and 0.6 mi (1 km) from Perrier Jouet. This comfortable hotel is set in Epernay. 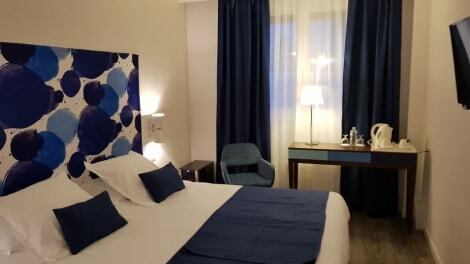 A total of 48 guests rooms are available for guests' convenience. No pets are allowed on the premises. Take advantage of recreation opportunities such as an outdoor pool or take in the view from a terrace and a garden. 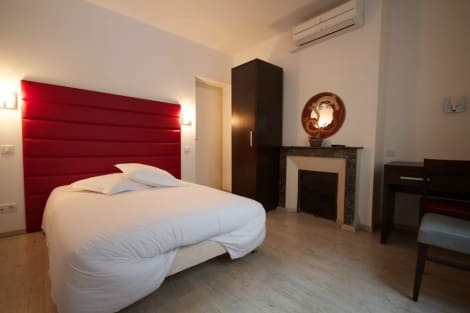 Additional features at this Belle Époque hotel include complimentary wireless Internet access, concierge services, and babysitting/childcare (surcharge). Getting to nearby attractions is a breeze with the area shuttle (surcharge) that operates within 900 meters. Épernay, the self-proclaimed capital of champagne, is surrounded by vineyards. Home to some of the world's most famous champagne producers, this bubbly nectar is bottled in the town and stored away in its network of chalk rock cellars. Indeed, the Avenue de Champagne has a vast 110 kilometres of these cellars, solely for housing champagne. It's no wonder that Churchill called it “the world's most drinkable address”. Which is a perfect reason to book into one of the many Épernay hotels. 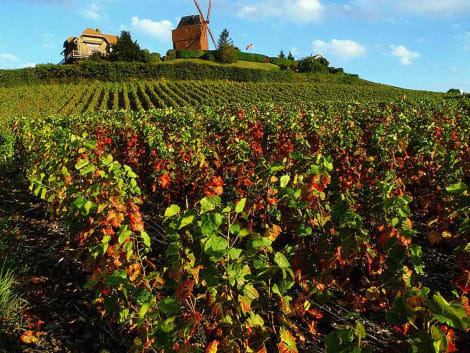 The main activity in Épernay is undoubtedly the range of champagne tours. The first champagne house opened here in 1729, followed in 1743 by Moët & Chandon, with Perrier Jouët, de Venoge and Mercier joining in the 19th century. Today, visitors can tour the famous cellars and enjoy champagne tastings. The most famous, Moët & Chandon's, takes you up to 30m beneath the chalky soil, into a labyrinthine 28km of cellars. You'll learn about the history and production of the champagne before tasting it yourself. To refresh yourself after your tasting, you can take a walking tour around the town. Must-sees include the Hotel de Ville, the beautiful gardens of the Moët & Chandon Orangerie and the Jardin d'Horticulture – home to the one of the most attractive Fauz de Verzy (dwarf trees) in the town. For those with an architectural interest, Épernay doesn't disappoint, charting its prosperity through different ages. From the Renaissance and classical buildings on the Avenue De Champagne, to Charles Perrier's Louis XIII-style Chateau-Perrier and the Hotel de Ville, the buildings here are statuesque. There's also the Art Nouveau Maison De La Lune, meaning the Moon House, with intriguing lunar architectural touches. There's also the Notre-Dame church, which houses magnificent 16th-century stained glass windows. Nearby, Saint Martin's Portal, a remnant of the previous Notre-Dame church, is an unexpected, imposing stone monument with intricate carvings. Unsurprisingly, Épernay has a number of dining options, including La Cave à Champagne which offers a comforSEOSITE_LEVEL_DESCRIPTION atmosphere and classic French cuisine. For something different, try Cook'In – a fusion of French and Thai dishes with adventurous offerings. The Pâtisserie Vincent Dallet is a popular choice for delicious sweet treats, from pastries to tarts, macaroons and chocolates…perfect with a glass of champagne.